In 2002, Chinese graphic designer Jianping He founded Hesign, a Berlin-based design studio. He studied both in China and in Germany, and his designs reflect the experiences of his training in both countries. In restrained color palettes, he executes bold poster designs with exacting precision, often incorporating both Chinese characters and Roman letters. To promote an exhibition of the work of famed graphic designer Niklaus Troxler, which He curated in Shenzhen, China, He drew his design inspiration directly from Troxler’s past work. Troxler has become best known for his posters advertising the Jazz Festival Willisau that he founded in 1975. 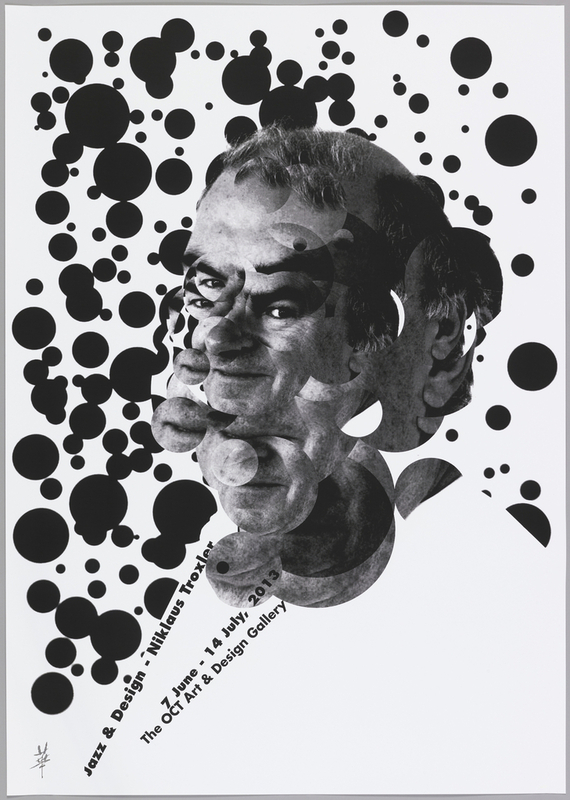 Many of Troxler’s own poster designs are in Cooper Hewitt’s collection. He echo’s Troxler’s aesthetic of repetitive, rhythmic patterns by cutting circles from a photograph of Troxler’s face and layering them in space against a white background punctuated by scattered black circles. Caitlin Condell is the Assistant Curator of Drawings, Prints & Graphic Design at Cooper Hewitt, Smithsonian Design Museum.